Moving companies’ software — for things like email, CRM, word processing and spreadsheets — into the cloud could save enough energy every year to power L.A. for a year. That’s according to a new report out Tuesday morning by Berkeley Lab and funded by Google (s GOOG). But the exciting thing about the report isn’t necessarily even the finding that cloud computing creates efficiencies. For several years cloud computing providers, IT companies, and researchers have conducted studies that have suggested as much. These types of studies have led to cloud computing companies to market their services as green, although there’s been some skepticism about just how green these services really are. To address the many nuances involved with cloud computing-driven efficiency, alongside the Berkeley Lab report the researchers created a new publicly available model that anyone can use to examine the energy and carbon emissions impact of various scenarios for cloud computing. IT managers can input data about their company’s IT services, data center type, region, and type of servers, and see how much energy would be saved by putting email, CRM or productivity software into the cloud instead of hosting it themselves. Finally, there’s a data-driven, easy-to-access way to see all the various subtleties around the energy efficiency of cloud computing. For both small and large companies that are wondering if opting for the cloud can save them money on their energy bill, now there’s a way to find out. The gains in energy efficiency from moving business software to the cloud mostly come from the fact that the data centers hosting these cloud services are far more efficient than the IT infrastructure used by most companies, and their servers are much more efficient, too. The energy savings are significant, particularly for small companies, which tend to have the most inefficient IT services. 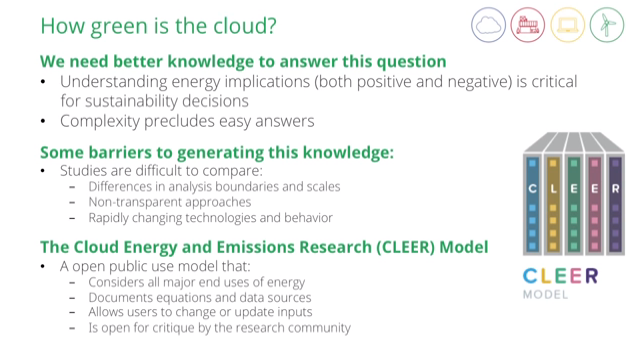 The lead author of the report, Northwestern’s Eric Masanet, discussed the model — called the Cloud Energy and Emissions Research Model, or CLEER — at Google’s How Green Is the Internet? last week, but launched the Model and the new report this morning. You can watch Masanet present his findings in the video below (he’s the first presenter). Masanet told me at the Summit that a lot of the research about the energy savings related to the Internet has been done around cloud computing because the cloud has shown some of the largest efficiency opportunities. At GigaOM’ Structure event next week, we’ll feature a variety of conversations about energy efficiency, clean power and the cloud, including a discussion between Bloom Energy’s VP of critical infrastructure, Peter Gross, and eBay’s VP of global foundation services Dean Nelson. and if you’re competeing against a US company , you can bet that company is going to have at the very least a few words dropped by a friendly politician . Choosing a cloud provider is a very important decision. A lot of smaller companies provide hosting but their network security is not up to par. When picking a company to have as your network or hybrid network host they should have a 24/7 commitment to security. The company should at the minimum also have their servers running in a data center collocation for protection. My company uses the following provider and we have been very happy with our service (no down time).